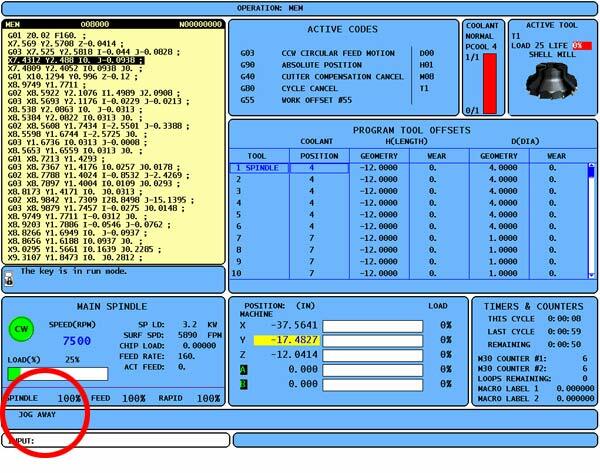 Run Stop Jog Continue (RSJC) is a cnc control feature available on Haas mills and lathes. RSJC allows you to stop a running program, jog away from the part and then resume program execution. Once the tool is away from the part, a worn insert or broken tool can be replaced and/or a critical feature can be inspected. Then the program can be resumed. Use caution, when the program is continued, the OLD or currently active offsets will be used for the return position and the machine will not return through the same path that you jogged away. If replacing tools, the length must be the same as the previous tool (offline tool setter recommended). To activate RSJC press FEED HOLD at a convenient stopping point in the program. Press Z, X or Y on the keypad followed by the HAND JOG key to activate the selected axis. The control will store the current X, Y, and Z positions. Axes other than X, Y, and Z cannot be jogged. Now you can use the jog handle, remote jog handle, jog, or jog-lock buttons to move away from the part. You can use control buttons such as AUX CLNT (TSC), or COOLNT to turn on/off the coolant (AUX CLNT requires that the spindle is not rotating and the door is closed). The spindle can be controlled by pressing CW, CCW, Stop, and Tool Release. If necessary, tool inserts can be changed. Jog to a position as close as possible to the stored position where RSJC was activated, or to a position where there will be an unobstructed rapid path back to the stored position. Use caution when the program is continued, the old offsets will be used for the return position. Therefore, it is unsafe and not recommended to change tools and offsets when the program is interrupted. Return to the previous mode by pressing MEM, MDI, or DNC. The control will only continue if the mode that was in effect when stopped is re-entered. 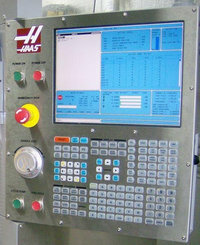 The control will display the message “Jog Return” and rapid X and Y at 5% to the position where Feed Hold was pressed and then return the Z-axis. The control will not follow the path used to jog away. If Feed Hold is pressed during this motion, the mill axes motion will pause and display the message “Jog Return Hold”. Pressing Cycle Start will cause the control to resume the Jog Return motion. When the motion is completed, the control will again go into a feed hold state. Press Cycle Start again and the program resumes normal operation.